I have been testing quite a few new mascaras since discovering MAC's Studio Fix. All are departures from a clean, modern MAC lash. Rimmel's The Max Volume Flash is a larger than life mascara with a hot pink bullet-like container with an ultra thick, intense formula. The best and most crazy comparison I can make is MAC's Studio Fix is the "Katherine Hepburn of mascaras". It is classic, modern and clean with no fussy tendencies. 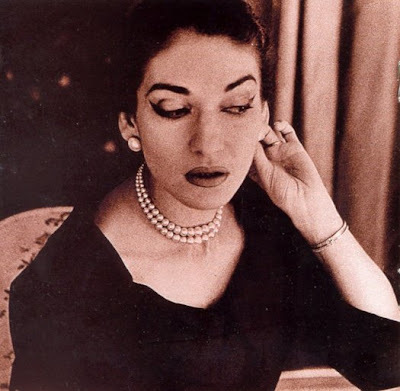 Rimmel's The Max Volume Flash mascara is pure Maria Callas. It is no wallflower and pure diva. It is bright lights and drama. The volume is operatic. I can see the sparse lashed gal losing her mind over this mascara. It does not have any crunch factor and truly delivers an improved lash fringe with fullness and shine. The Max Volume Flash boasts the biggest brush from the Rimmel line. The brush is slightly smaller in volume when compared to Maybelline(EDITED) Colossal mascara bristles. The formula is thick and a shiny black. It contains Collagen and Keratin to fatten and strengthen the lashes. You immediately notice the increased volume and definition in comparison to the results from MAC Studio Fix. It coats each lash generously and quickly with one swipe. This easy application is a great plus. The drawbacks are the heavy texture. This prevents curl. I had to use my lash curler before and after application. My curl disappeared after a few short hours. It also has some mess issues. It did not clump on the brush or lash. However, I did have some flaking issues. Nothing too serious. Just some small specks. The scent is fairly strong. It smells like a mix of play-doh. Overall, I think it is a solid performing drugstore mascara. It delivers on increased volume. It will not be holy grail material for the short lashed afflicted. Rimmel's The Max Volume Flash mascara is currently at your local drugstore. It retails for around $7. Visit http://www.rimmellondon.com/US/home.aspx for more details. Disclaimer: This mascara was purchased at a local drugstore by Cavewoman and gifted to me. I need to try this mascara! I have been looking high and low for a great one! Thanks for helping! Thanks for the review. I saw this in a mag recently and was going to try it. Think I'll pass though - my wimpy lashes can't afford to be weighed down. this sounds kind of good despite of your saying it may not be a HG material. but mascara is so very personal... thanks for the review, neverthess. it's always fun reading your writeup. Cool - I like to know what my drugstore options are when I can't afford to buy a new MAC mascara. I've been on a over$20 mascara boycott lately. I refuse to think that I can't find a great performing mascara for under $15! Regarding the eyelash curler issues, I have found that waterproof mascara works better for curling than non-waterproof. Jenna: It is Maybelline. Let me go edit! does it smear? what other drugstore mascara would you recommend that doesn't smear but delivers some volume, curl, and length? Now that Max Factor is defunct(Good bye, the greatness that was Volume Couture!). I need to find a comparable drugstore mascara. Is there anything that comes even remotely close? My Day Has Finally Come!